Directed by Martin Campbell. Starring Ryan Reynolds, Blake Lively, Peter Sarsgaard. I should probably start by stating few facts about my position with Green Lantern and superheroes in general. First of all my only little knowledge of Green Lantern came actually from an episode of “The Big Bang Theory“, other than that, I didn’t even know there was such a comic until I read that Martin Campbell was going to make a movie. In other words, I wasn’t really a fan (and let me spoil you the surprise: I’m still not one!!). However, I always try to be as open-minded as possible, in fact I was quite excited to learn something new about a new superhero. The fact that I hardly knew the existence of Green Lantern had nothing to do with me not liking the film: I wasn’t a fan of Thor either, and yet I did manage to enjoy the film for what it was (here’s my Thor review) and as far as the X-Men I knew next to nothing when the first Bryan Singer movie got released and still liked it. Finally, I should also point out that I have nothing against comic superheros either (in fact I still consider Spiderman 2 one of the best action movies of the last few years!). 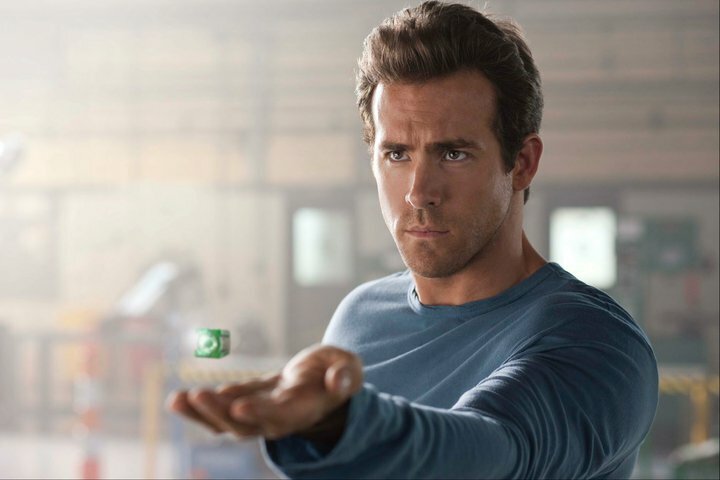 Green Lantern opens with a very confusing prologue, visually unoriginal and heavy in exposition, characters and soulless CGI. And as it got louder and louder, more and more frantic the whole thing got even more confusing. I must confess, the film lost me right from the word “go”, but I decided that it didn’t really matter: “It’s a comic! How hard can it be?” I said to myself. Thankfully I was right and when finally the action cuts to planet Earth I was able find my bearings again, though the feeling of boredom stayed with me throughout. Director Campbell, never really seems to be in control of what’s going on and instead he decides to cram the film with as much noise as possible hoping it might distract his audience from thinking that this is actually all a bit of a mess… The result is that sometimes even some of the dialogue gets lost (though I’m prepared to bet that despite those 4 writer being credited, I didn’t really miss much). Campbell clearly feels uneasy with this universe and doesn’t quite know what to make of it. The whole philosophical side is just ridiculous, the action scenes are too messy, the special effects underwhelming and the love story is so flat that it becomes redundant. The pace is completely off and for a film of this kind which lasts just under two hours, I found myself looking at my watch way too often. The editing is just as uncertain just like the rest of the film, as Stuart Baird seems to be randomly cutting to wide shots and close-ups, irrespective of what the action would require and not taking into account that a film in 3D should really hold its shots for much longer, otherwise the 3D effect is lost on its audience. But then again, who cares about 3D! This is another of those films that’s been converted into 3D after it was filmed (and my God, it shows!!) and I suspect will have a very short life in this form: many people will probably watch it on DVD or on TV anyway, so why bother cutting it for the 3D format. Those action scenes, particularly at the beginning, are so fast that you really have no idea what’s going on. It doesn’t really help the fact that there are way too many characters, obviously introduced to us because of a possible sequel (clearly set up in the end credits with a silly plot twist): after all today it’s all about franchises, isn’t it? (Bloody hell, Warner, aren’t you happy with your 8 Harry Potter films and your never-ending Batman?! Do you really want to embark into another franchise? ). Peter Sarsgaard plays a sleazy over-the-top baddie without a proper script to allow him to actually be one of those really good baddie. Mark Strong is pretty much wasted, not to mention Tim Robbins in what is possibly his most forgettable role in years. Angela Bassett plays is as if she’s been told “you’re not allowed to show any emotion, in fact deliver those lines thinking of something else…”. Even Geoffrey Rush who probably had a couple of hours spare in his schedule was just happened to pass by the film set, lends his voice for one of the character sounding pretty much like one of those Owl from that film by Zack Snyder. Finally James Newton Howard‘s film soundtrack (who I usually really like) is as derivative as all the rest. Not bad, but certainly unremarkable, just like the film itself. In the end, this is probably out there with some of the most disappointing comic book movies of all times (Elektra, Daredevil, Spawn, The Avengers, the 1998 versions, just to mention a few…). Its main crime is that it thinks is a lot better than it is… and that it must have cost a lot of money too!! Excuse me, but the Avengers cannot be one of the most disappointing comic book movies of all time because it hasn’t yet come out into the theaters. Heck, the Avengers hasn’t even completed filming. Perhaps you’re refering to the Avengers movie based on the 1960’s british TV series? I’m actually referring to the God-awful 1998 version with Uma Thurman and Ralph Fiennes (so bad that’s almost been deleted from people’s memory and the fact that you don’t even remember it proves my point… hehehe). I’m going to update my post with a link, to avoid further confusions.